Interested in diversifying your skills? The Master of Science in Management (MSM) program is designed specifically for students from non-business majors. MSM students gain a solid business foundation and strengthen transferable skills to open up advancement opportunities within their undergraduate major field or business sector. The program offers traditional, combined (bachelor/master) and dual degree (Master/PhD) options. MSM combined (bachelor/master) students can save time and money by “double counting” credits between the bachelor and master degrees. Join us for an information session on Wed., Oct. 28th at 6pm in Hough Hall 120 to learn more! Are you a graduate student considering a career in academia? The Career Resource is offering these workshops to learn more about navigating a job search for faculty or post-doctorate positions. The Education College Council (ECC) meeting to be held on Wednesday, Nov. 4 has been cancelled. If your club has updates to share or any questions, please email ECC at ecc@coe.ufl.edu. We are anticipating 300 educators from around the state of Florida to come together in the name of global education and global citizenry. In partnership with several University of Florida area studies centers, we are confident that this conference will inspire educators to create global citizens in their classrooms. To reserve your spot, submit this form. A Registration Fee of $15​ will include a light ​breakfast, lunch, a conference t-shirt, and a $2 donation to Professional Development for Educators in Haiti! Please direct any questions to connected@projectsforhaiti.org. We are looking forward to a fantastic event and hope that you will be able to join us this November! Please join UF’s Education College Council and College of Education, in partnership with the River Phoenix Center for Peace Building, Peace4Gainesville, Alachua County Public Schools, PACE Center for Girls, UF’s Center for the Study of Race and Race Relations, Center on Children and Families, The Bob Graham Center, and Florida Society for the Social Sciences for a screening of the James Redford film Paper Tigers. The event will take place on November 16th from 6:15-9:15pm in the New Physics Building, Room 1002. A complimentary pizza dinner will be offered before the film and a panel discussion on how to build a trauma responsive community in Gainesville will follow. UF Scooter and Motorcycle Rally will be held on November 21, 2 hours before kickoff (TBA) against Florida Atlantic University. We will be giving away safe riding gear. Register and enter to win helmets. #gatorsgearup and RIDE SMART! Contact Dr. Maria Coady (mcoady@coe.ufl.edu) for additional information. The First Annual Special Education Research-to-Practice Symposium will focus on bringing together our special education Dual Certification MEd and Ph.D. students in a professional conference-like environment with Dr. Mary Little as the keynote speaker. Please see flyer for more information. This organization was established for the purpose of educating college students on the prevalence of, effects of, and reasons behind bullying. For more information and to apply for one of the available positions, please visit the SABI Facebook page. If you have suggestions of books for the library to purchase, please contact either Rachael Elrod at relrod@ufl.edu or Tiffany Baglier at tbaglier@ufl.edu with your recommendations. You are invited to participate in an International Conference called: Poverty, Globalization and Schooling: A Holistic Approach, that will take place at the University of Central Florida, in Orlando, FL, February, 18-20, 2016. For information, click here. EDF 6812/EDG4930 Comparative and International Education. Tour education around the globe without leaving UF. This course, facilitated in seminar format, will explore education from multiple perspectives, including international development, literacy and language, teacher education, education for economic and social justice. Offered Mondays, periods 6-8. Contact Dr. Maria Coady (mcoady@coe.ufl.edu) for additional information. Baker Teaching Fellowship Applications Available for 2016-2017 School Year! KIPP Jacksonville Schools is accepting applications for the Baker Teaching Fellowship which starts in July of 2016. These fully certified teachers will receive mentors under a master Lead Teacher, serve as a full staff member in their school, and have instructional responsibilities over the academic year. It is the perfect opportunity to continue to grow as a new educator. The positions are fully salaried with benefits and you get the security of obtaining a job well before you graduate if accepted. You can read the full job description and apply by clicking this link or copying and pasting http://goo.gl/l9pHk9 into your browser. Email Lauren at lmartin@kippjax.org with further questions! Mt. Carmel Baptist Church is seeking volunteer tutors for its Saturday Academy. Tutors will be asked to make 3-4 visits per year and to plan interactive mathematics and science activities for students from the local community. The Saturday Academy’s schedule is aligned with Alachua County’s school schedule and runs 11am-1pm each Saturday. To volunteer to receive more information, please contact Mrs. Tennessee Jones (352.332.2367), Mrs. Catherine Mickle (352.376.0993) or Mrs. Rose Turk (352.378.3812. Here at The Center for Leadership and Service, we like to foster the leadership development of each student through the importance of service to others. That being said, there are a few upcoming events, opportunities, and updates that the CLS would like to share. If you are interested in these opportunities and have the drive to make a real difference in the world, please click here. College of Pharmacy is looking for an Educational Technology Assistant to work 20 Hrs/Week OPS position. Work will involve course development work in Canvas, create graphics and manage graphics and prepare content for content production, review content for its validity etc. prior to posting, build quizzes, update links due dates and test course prior to release. Experience – Some experience with Canvas or other learning management systems, good graphics skills with using software such as Photoshop, good time management and ability to handle multiple projects to meet deadlines. Rate $15.00/ Hr. Start date Asap. Please contact rnarasi@ufl.edu with resume, and sample of work. Innovative program introducing the sport of fencing to Elementary students in one hour classes.The Florida Fencing Academy will provide you with the training necessary to work in an elementary after school enrichment program. See flyer for details. Algebra 1 tutor needed for 14-year old female high school student in Gainesville. Please contact Tazi Thelismont at 561-317-8337; ortazithelis@yahoo.com. For experienced tutors, pay is $30-$40 an hour. We are looking for a nanny to help with our two-year-old daughter and three-month-old son. One of us, either my wife or I, will be home during the time we need somebody. Looking for someone to start very soon, as of November. Ideally Monday through Thursday from 8:30 AM to 12:30 PM. Please email morningbellonline@gmail.com. UF faculty member looking to hire highly motivated, mature and reliable person to help with after-school care for their 6 years old daughter. Tasks will include picking her up from a school (on Mon, Wed, Thursday & some Fridays) and stay with her until 5:30pm (help with homework/tutoring for reading and writing and light household chores). Must have own transportation and good driving record. If interested, there will also be additional babysitting opportunities in the evening and weekend also. 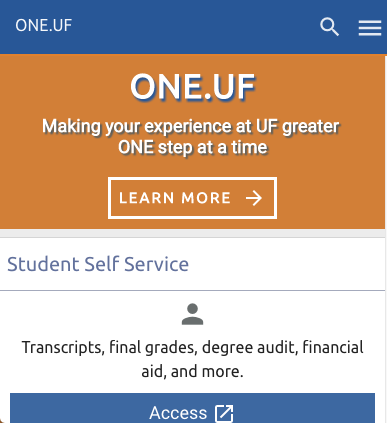 Contact phalyka@ufl.edu. 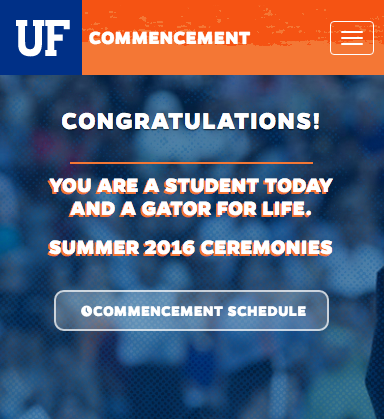 Calling all UF Education Students! Personalized learning technologies offer significant promise for bringing about fundamental improvements in education and training. 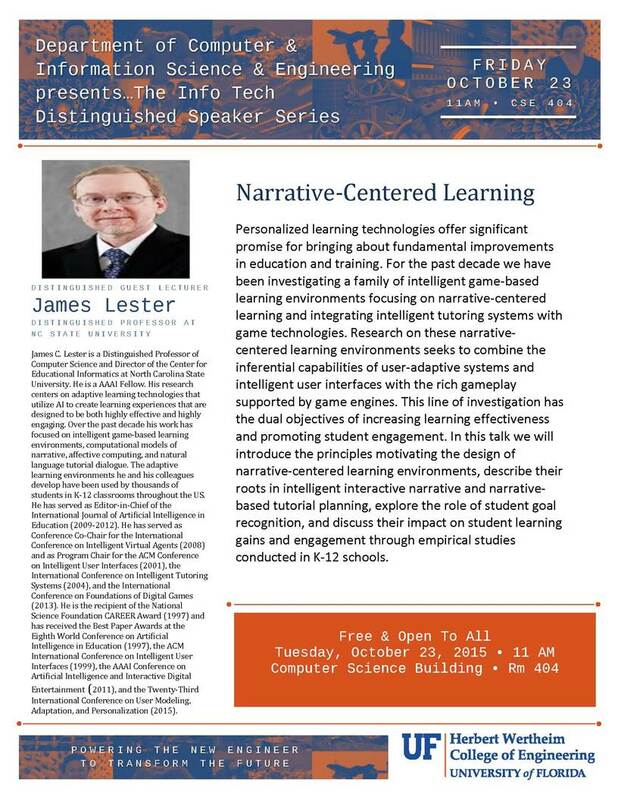 Join Distinguished Guest Lecturer James C. Lester on Friday, October 23rd for more on this topic. Dorothy L. Espelage, Ph.D. is the recent recipient of the Lifetime Achievement Award in Prevention Science of the American Psychological Association. She has conducted research on bullying, homophobic teasing, sexual harassment, dating violence, and gang violence for the last 20 years. Join her for the Large-Scale Clinical Trials of Social-emotional Learning Middle-School Program in US Schools: Challenges of Implementation, Competing Programming, & Sustainability talk on Monday, Oct 26th from 10:40-11:40am in the New Physics Building Rm 2205. The University of Florida, a partner institution in the Davis United World College Scholars Program, is pleased to announce an opportunity for undergraduate students to design a grassroots project for peace anywhere in the world! The Davis Foundation will award the winning project $10,000 for the project to be implemented during the summer of 2016. Undergraduate students use their creativity to design a project that focuses on conflict resolution, reconciliation, building understanding and breaking down barriers that cause conflict. Due to this generous funding, UF students have had the opportunity to travel and perform service projects all over the world (Niger, Brazil, Bolivia, Haiti, Rwanda, Mexico, Tanzania, Cambodia, India, Palestine, Swaziland, Macedonia, and Uganda). Deadline to apply January 8, 2016. Learn more about this program at http://bit.ly/projectsforpeace16. Experience – Some experience with Canvas or other learning management systems, good graphics skills with using software such as Photoshop, good time management and ability to handle multiple projects to meet deadlines. Rate $15.00/ Hr. Start date Asap. The Office of Human Resources and Educator Quality at the District School Board of Pasco County would like to invite you to our Fall Instructional Job Fair. We will be conducting on-the-spot interviews, and giving contingent offers for available positions! WHEN: Thursday, November 12th from 3:00 p.m. – 6:30p.m. We are looking forward to connecting with anyone interested in becoming a teacher or working in Student Services. · We will have principals from our Elementary, Middle, and High Schools as well as managers representing our Student Services department. · We will have someone available to speak about out Professional Development Certification program for non-education majors and degree holders. We are excited to meet upcoming and recent graduates and speak to them about current and upcoming teaching opportunities for the 2016-2017 school year. We will also have door prizes and giveaways! Please feel free to distribute the flyer to students, and on social media as you see fit. If you have any questions please contact Lori Perreault at 813-794-2845 or LPerreau@pasco.k12.fl.us. ECC is holding a general meeting on Wednesday, October 14 at 7:15pm in Norman 2325. All students in the College of Education are welcome to attend. Committee positions are available for interested students. Our 2nd workshop of the semester will be this coming Wednesday, October 14th @ 7:30pm in **Norman Hall Room 250. We are happy to welcome Joe Johnson, as our guest speaker, to share the effect community relationships have on students and tips of how to bring the local community into the classroom. Join us for a great time! Join us from 10am-2pm on Thursday, October 15th in the Reitz Union Grand Ballroom. Network with admissions representatives representing over 130 graduate schools and programs! See flyer for additional details. Want to go to a conference and present your data in a succinct way? Create a research poster! Need to prep yourself for the poster session for Graduate Student Research Day? Join The Student Alliance of Graduates in Education (SAGE) at this panel detailing the methods for creating a quality research poster. Fellow graduate students who have created award-winning posters and professors who have judged poster presentations will share their advice and expertise. Information will include graphic design considerations, tips on presenting the data, and ideas for honing your poster presentation skills. A question and answer session will follow. Attending this panel will automatically enter you into the Graduate Student Research Day raffle in which you could receive an iPad! This panel will take place in the Norman Hall Terrace Room on Thursday, October 15th from 2:30-3:30pm. For additional information, please email SAGE’s secretary, Lisa Lundgren, at lisa.lundgren@ufl.edu or visit SAGE’s Facebook page. 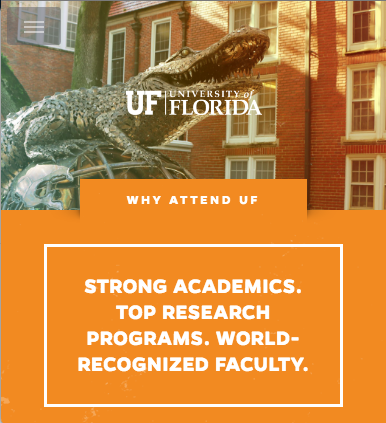 We are excited to announce that the 2015 Florida Association of Teacher Educators (FATE) conference will be taking place October 16th and 17th in Gainesville, Florida. This two-day conference will be held at the Hilton University of Florida Conference Center. The featured speakers include: author and researcher Dr. Pedro Noguera, FDOE Program Specialist Alvin Davis, Deputy Director of Just Read Florida! Laurie Lee, and CNN Hero Connie Siskowski. We hope you will consider attending. The registration form can be found online at www.FATE1.org and the student registration fee is $50.00. We hope to see you in October! You don’t have to start your own company to think like an entrepreneur. This session will focus on being a thought leader, problem solver, and change initiator WITHIN any organization. Learn to lead without being CEO. You’ll hear from Brandon Piper, Manager of Outreach at Success Academy Charter Schools, a network of 34 public charter schools in New York City. Success also acts as a catalyst and model for education reform nationwide so that all kids can have access to high-quality schools. There will be an opportunity to find out how to apply (deadline January 8, 2016) and hear from last year’s project winners at the info session. Learn more about this program at http://bit.ly/projectsforpeace16. Please join Teaching for Social Justice for “EdTalks: Critical Conversations in Education” a panel discussion on Women in Higher Education. Our panelists, Dr. Carole Beal, professor of educational technology, Dr. Aki Murata, associate professor of mathematics education, and Dr. Rosana Resende, lecturer for the Center for Latin American Studies, will be speaking about the experience of being a woman in higher education. The event will take place in Norman Hall room 2329 on Wednesday, October 21 from 5:30-6:30pm. Please visit TSJ’s Facebook page for more information. On October 22 from 12-1:30pm in the Norman Hall Terrace Room, College of Education graduate students, faculty, and administration are invited to attend an interactive workshop focusing on how to proactively be inclusive of LGBTQ people and issues within their specific educational context. Participants are encouraged to bring something with them that they would like to “queer” (course syllabus, dissertation, office policy or procedure, assignment, etc) Those interested in attending should RSVP here by October 21: http://bit.ly/queeringeducation. Please contact Brittney Beck at grace4@ufl.edu with questions or ideas. As the undergraduate research community works to ensure that those in the U.S. Congress have a clear understanding of the research and education programs they fund, nothing more effectively demonstrates the value of undergraduate research than a student participant’s words, work, and stories. Undergraduate research must be among the programs that members of Congress understand if it is to continue to be supported, and to grow. Students and their faculty mentors are invited to apply for the Council on Undergraduate Research’s (CUR) 20th annual undergraduate poster session on Capitol Hill. In addition to other events, there will be an evening poster session and reception where students will have the opportunity to speak directly to members of Congress and demonstrate how they have been impacted by these programs. Please visit the website for more information about the submission process and Posters on the Hill program. Questions? Please contact Sabrina Hall at studentprograms@cur.org. The Guardian Catholic Schools, Holy Rosary and St. Pius V have an immediate opening for a Middle School Math Teacher. Applicants should have strong teaching skills with the ability to differentiate learning and integrate instructional technology into daily lessons. Experience with the CHAMPS approach to classroom management is preferred. The ideal applicant is a practicing Catholic capable of teaching religion as well. Please review our website to learn more about our school, www.stpiusjax.com. Qualified applicants who have or are eligible for the appropriate Florida certification should send a cover letter, resume and Employment Application to Sister Dianne Rumschlagg, Executive Director of Education. The Employment Application can be found under Quick Links section of this page: http://www.dosafl.com/catholic-schools-employment/. St. Pius V Catholic School has an immediate opening for a first grade teacher. Applicants should have strong teaching skills with the ability to differentiate learning and integrate instructional technology into daily lessons. Experience with the CHAMPS approach to classroom management is preferred. The ideal applicant is a practicing Catholic capable of teaching religion as well. Please review our website to learn more about our school, www.stpiusjax.com. Qualified applicants who have or are eligible for the appropriate Florida certification should send a cover letter, resume and Employment Application to Lauren May, Principal, at principal@stpiusjax.com. The Employment Application can be found under Quick Links section of this page: http://www.dosafl.com/catholic-schools-employment/. The UF Boys and Girls club is a new organization created to facilitate volunteers and interns for the three Boys and Girls club centers here in Gainesville. We focus on using UF students to better their afterschool and summer programs by providing tutors and support for the children to learn and grow in a safe environment. Following internship or volunteer completion, there could be opportunities to be employed by Boys and Girls Club and advance to the local and national level. Gainesville family with four children ages 5 years old, 4 years old, 3 years old and 3 years old seeking babysitter on Saturday mornings, Sunday afternoons, and one weekday evening per week. Responsibilities include playing with children, taking walks to nearby playground, making meals for children, and helping children as they learn to clean up. No driving. References will be requested. If interested please email Chris at crcogle@me.com. My husband and I are interested in having someone tutor our son, who is currently in fourth grade (9 years old), on a weekly basis (1 hour). A tutor with experience or interest in helping children with dyslexia and dysgraphia would be appreciated. Please click here for further details. If you are interested in working with our son, please contact Larett Dietrich, (352) 871-5221 (call or text) us to work out the details. Interested in tutor for nine-year-old elementary school student in third grade at Stephen Foster Elementary School. Tutoring would be in reading and math. Please call Mary at 352-262-8237 for more details about this opportunity. I am looking for a female student with interest in special education to tutor my son, a fourth grade student with Asperger syndrome (main problem is attention). The tutoring will be daily (M-F), for approximately 1 hour in the afternoon, at Sun Country-Jonesville (they will provide a special place for tutoring). Negotiable salary and hours. Need to start as soon as possible. Please email maria.isabel.longo@gmail.com. Great opportunity for an elementary education major to get real word experience with Common Core and Florida Standards. Homework support and daily review. Monday – Thursday for at least 1 hour. 5th grade female student: Reading and Math focus. You are cordially invited to attend our first annual Day of the Girl Summit which will have a focus on education and other topics that may be of interest to education students. It will be on Sunday, October 11th from 9:00 AM-2:30 PM in celebration of International Day of the Girl. Check out our Website, dayofthegirluf.splashthat.com & FB event, www.facebook.com/events/1642333119315869/ for more details. The College of Education has coordinated with the University of Florida Control Flu team to administer the flu vaccination, FluMist or flu shot, in Norman Hall Room 158 on Wednesday, Oct 14th from 9am-1pm. There is also a tentative date scheduled for Thursday, October 15th from 1:00-5:00pm, if there is supply left. There is no cost to you. Your health insurance company will be billed, therefore you must bring your health insurance information (company and policy number) along with a photo ID. If interested, please complete this brief form http://tinyurl.com/ControlFlu-UFCOE, by Monday, October 12th. The first Schools, Society, & Culture colloquium of the academic year will be held at noon on Wednesday, October 14 from 12-1pm and will feature three original presentations in recent American educational history. All are welcome. 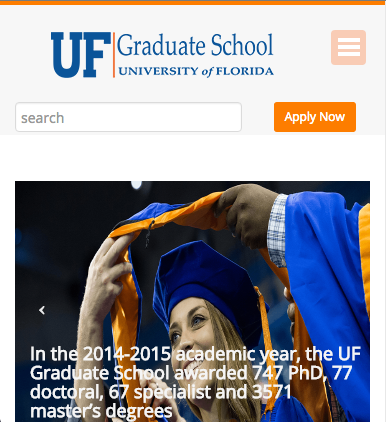 The Institutional Repository (IR@UF) offers a central location for the collection, preservation, and dissemination of scholarly, research, and creative production alongside historical materials from the University of Florida. For a list of open access materials and upcoming workshops, please click here. The GREEN Program is recruiting for 2016 Winter programs. The curriculum is designed to get student leaders out of the classroom to focus their passion on initiatives that are in line with the Sustainable Development Goals. Click here for more information and the application. Elementary School Teaching/Elementary Teacher at Bronson Elementary, Title 1. For additional information and to apply, click here. 2nd grade social studies teacher at Yankeetown School. Please click here for more information and an application. Learn more about opportunities in HCPS through Teach in Tampa and apply today. Additionally interns may view the calendar of events and register online for upcoming activities. We are looking for an advanced undergraduate or graduate student to code video data and conduct other duties for an IES Goal 3 Efficacy trial on embedded instruction for young children with disabilities. We are seeking someone who is available for approximately 20 hours per week and can continue employment through August 2016. Experience with early childhood intervention programs and/or students with disabilities is desired. The position is paid hourly at $12/hour. This is a great opportunity for any student interested in learning more about research and behavioral observation. If interested, please email Dr. Crystal Bishop (crowecd@coe.ufl.edu). Interested in hiring a tutor for at least one 7th grade boy for this semester and next. The student needs to be tutored at Oak View Middle School for one hour between 3:00 and 4:30 in the afternoon two days a week (Monday, Tuesday, Wednesday, or Thursday – can’t do it on Fridays). I would like to make sure homework is on track and being done correctly and reviews for upcoming exams are done as well. He needs a bit of extra help to make sure things are being done in a timely manner (without Mom “nagging” him all the time). If anyone is interested, please contact sstocks@ufl.edu.